There is often nervousness about activating My Sites in an organisation. Here are some benefits of doing so. Encourage people to use the space on My Sites as backups for laptops for those very important docs that aren’t ready for team sites yet. The default space limit is 100MB per user, but some companies make it much more if there’s enough capacity on the platform to cater for this. This also creates awareness in thinking about taking care of their (and thus their company’s) content. Libraries on My Sites can be used to share content with virtual groups that don’t fit into the formal structure of the company. For example, innovation teams – they may not necessarily consist of people all from the same area. My Sites is an ideal way to share information with each other. In onsite training, people from different areas are thrown together and go through the curriculum together. These groups tend to want to share SharePoint information with each other that they’ve learnt in the training. My Sites is again ideal for this. Many students like to take their own notes and share them with their class colleagues. This helps in breaking down silos over time and encouraging users to share more. It is important that the People Search results are working correctly on the platform. Staff turnover costs are costing companies millions annually. 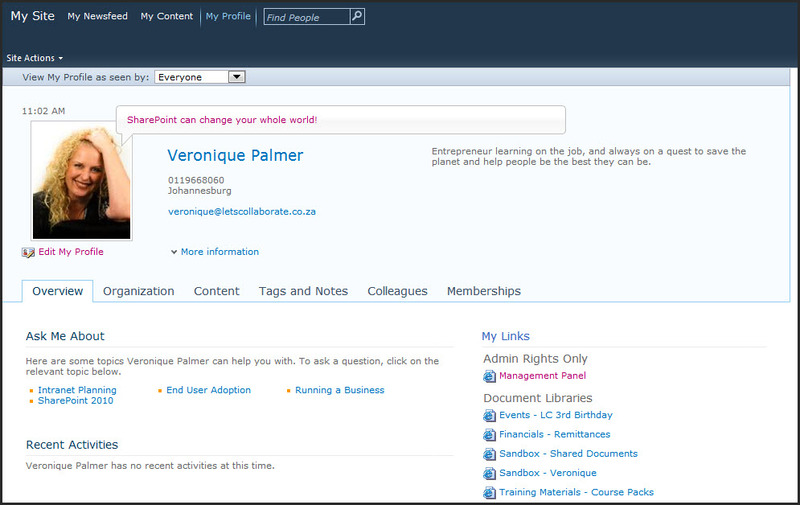 You are able to search for people based on names or areas of expertise from your My Sites (or All Sites). If People Search is configured as robustly as possible, and people have completed their profiles, it will solve half the problem of finding skills internally. It’s unlikely that HR always has the latest CV on file, and if they do, it may not be electronic. Encouraging people to update their skills on My Sites, enables the entire organisation to find the skills they need inhouse. It’s far more efficient to move a bored staff member with the right skills to another position, than losing them and having to hire someone else. The My Sites functionality is an important part of the change management process and helping users think in a different way. It’s about enabling people to build internal networks to create pockets of expertise so they can keep track of their personal network and find information quicker. It’s about using the tools you have available inhouse to empower people to change their world and how they look at, create, store and find content. Done correctly, people can be encouraged to take ownership and responsibility for their personal brand, and by extension, the company’s brand. The importance of brand building on a personal, team, department, division and company level; as well as the pros and cons of not actively doing so can be demonstrated via My Sites. It’s also a safe platform to do so as it’s internal to a company, unlike a very public Facebook, Twitter or LinkedIn. My Sites can be used to explain the benefits or a social media policy and the importance taking it seriously or risk serious damage to the brand. There is so much information just in people’s heads, undocumented. The amount of content people are creating every year is becoming insurmountable to manage. It is crucial to be able to find the subject matter experts as well (or instead) in order to retain skills, find the right info, and prevent duplication of effort. All the Tags and Notes functionality is tied to My Sites. They are used to show people how to use those in order to tag their most important information the way they want to – this is very empowering for people. It illustrates the difference between folksonomy (user defined tags), and taxonomy (formal structure of tags), and what to use when. This teaches people why structuring information is a good thing. That will also help long term down the line when the formal company-wide taxonomy has been decided. People will be more likely to implement it because they’ve had some experience tagging stuff themselves as they have been seeing the benefits themselves. The My Sites functionality always takes people by surprise because the perception is out there that SharePoint is just a document repository. Showing them My Sites and what they can do expands people’s minds and immediately makes them look at SharePoint differently and ask ‘what else can it do’. This is great for the adoption process and long term ‘stickiness’ of SharePoint in a company. Don’t be afraid to try it. There are many governance measures you can put in place to manage My Sites. The benefits of the functionality outweigh the cons. I really appereciate your work, its really good. SharePoint is a web-based application, which is utilized for data collaboration, storageand for record administration at big business level. You can utilize SharePoint to fabricate complex web applications. I’ve come across this article which shares information about Sharepoint and its benefits. You will love to read this. Thanks!